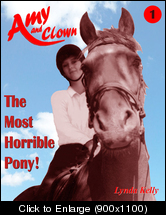 Just to say I've scheduled a FREE eBook download - The Most Horrible Pony (1) Amy and Clown - this weekend (8th & 9th). I think I have this one already but if anyone hasn't got it grab it this weekend for early Christmas present to yourself! I dont have this book, but I will be getting it when it is free.